This paper explores some of the reasons behind the escalation of violence derived from the way in which Calderon’s government has approached the problem of drugs. It addresses the questions: why did Calderon’s administration decide to intensify the war on drugs -despite the violent consequences- and how did this process occur? I argue that Calderon’s regime made this illegal aspect of trade its own battle for legitimization purposes, both nationally and internationally, and to foster economic and political collaboration from the US after the cooling of the bilateral relations following 9/11, through constructing drug trafficking as the major threat to Mexican national security and deploying the military forces to fight a war that was, from the beginning, predictably lost. At the same time, the US has used the same mechanism of portraying drug trafficking as a priority threat to the nation for fostering cooperation with Mexico in security and political terms. Nevertheless, NAFTA produces and reproduces the material and legal bases that nourish the threat that together, Calderon’s regime and the US fight with a military war in Mexican territory, generating a vicious cycle and, as a natural outcome, the escalation of violence that Mexico faces nowadays. 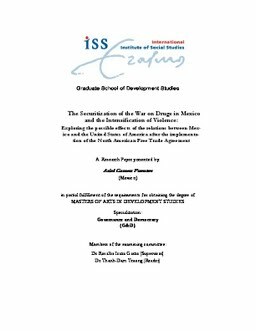 Relevance to Development Studies This study aims to expand the analysis of the securitization process of drug trafficking focusing on the case of Mexico by analyzing how drug trafficking has been socially constructed as a threat. In particular, it aims to explain how material and legal forces derived from the implementation of NAFTA influenced this process, which in turn has framed the context of violence and insecurity that prevents the further development of the country.